Kitchens everywhere are filled with busy chefs and cooks preparing delicious meals. Fridges and freezers are packed with all sorts of goodies. And people from all over are flying and driving to gather with loved ones. I have always looked forward to Thanksgiving. Not necessarily for all the food, but for the company of friends and family. 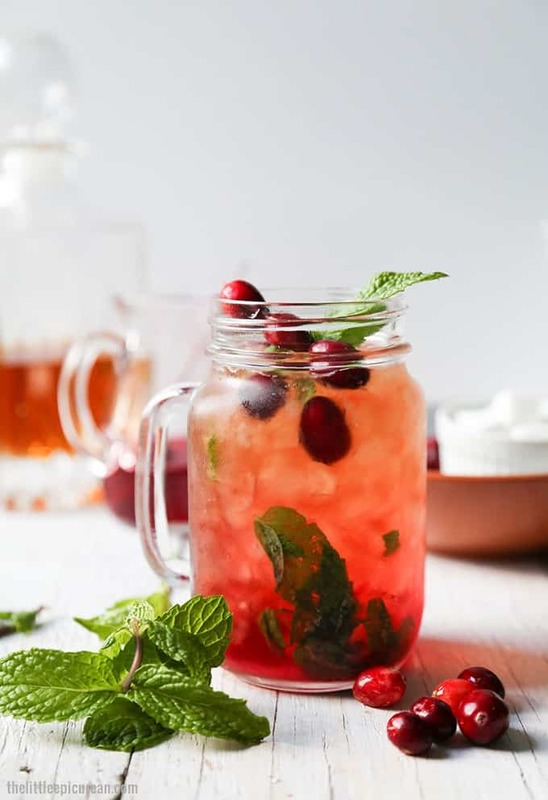 For this year’s holiday season, I will be serving this cranberry cocktail inspired by a classic favorite- the mint julep. I love, love, love mint juleps. 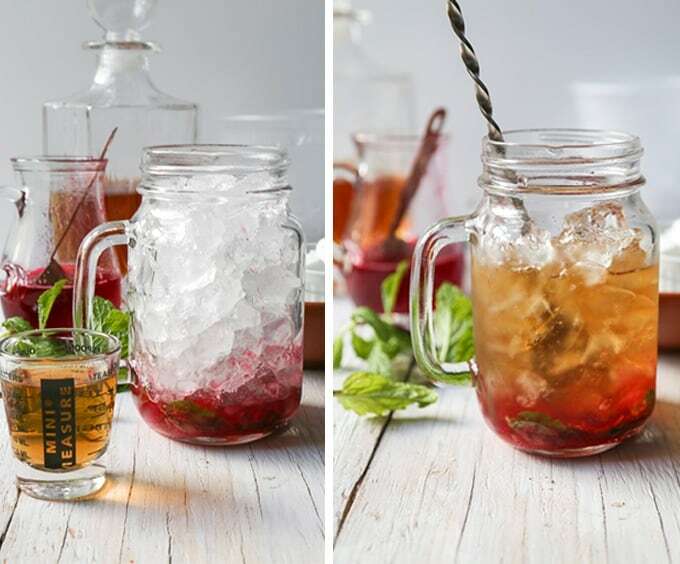 Asides from iced tea and lemonades, nothing cools me down faster in the summer than frosty glass of mint julep. Sure, it may be cold (rainy/snowy) outside, but a mug of this cranberry mint julep will surely warm you up! 1. 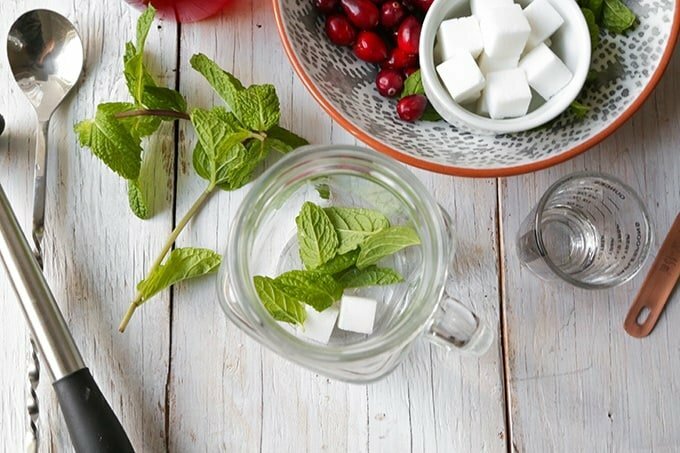 Place mint leaves and sugar cubes in a glass. 2. Add 1 Tbsp of cranberry syrup and muddle everything together until sugar cubes have dissolved. 3. Fill glass with crushed ice. Add 2 1/2 oz of your favorite bourbon. (DO NOT use large ice cubes, you want CRUSHED ice. The drink is very strong and potent. It needs the crushed ice to dilute drink slightly.) Use a spoon to gently stir mixture together. 4. Add additional crushed ice. Add another 1 Tbsp of cranberry syrup. 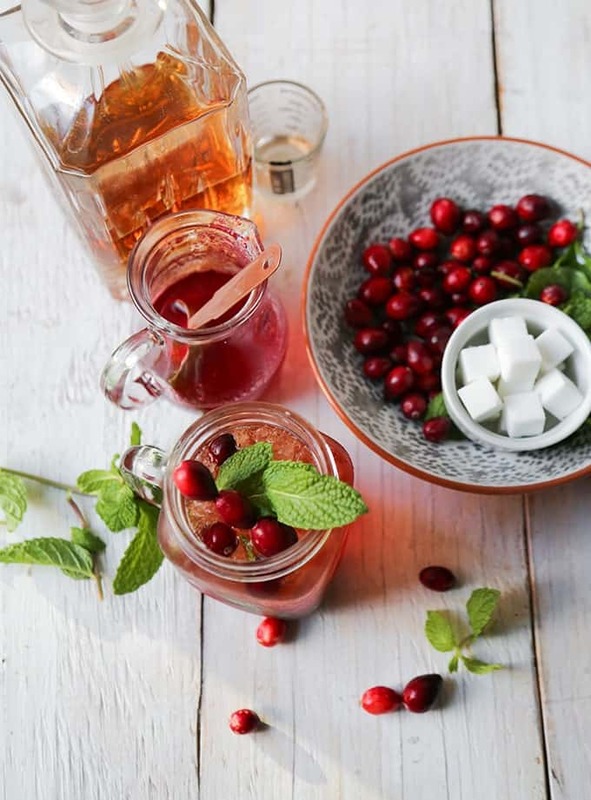 Garnish drink with mint leaves and fresh cranberries. And voilà! 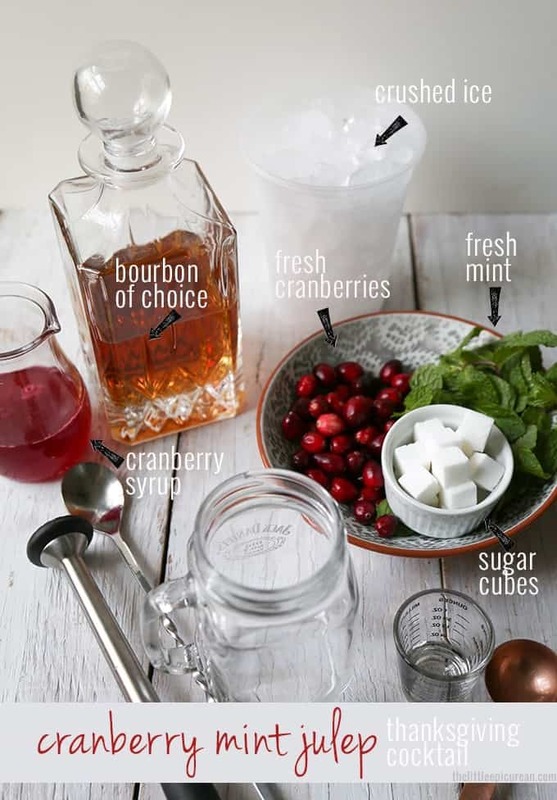 You are ready to enjoy an icy, frosty cranberry mint julep! Cheers! I wish you all a very happy holiday season filled with much love, laughter, and good food! Place mint leaves and sugar cubes in a glass. 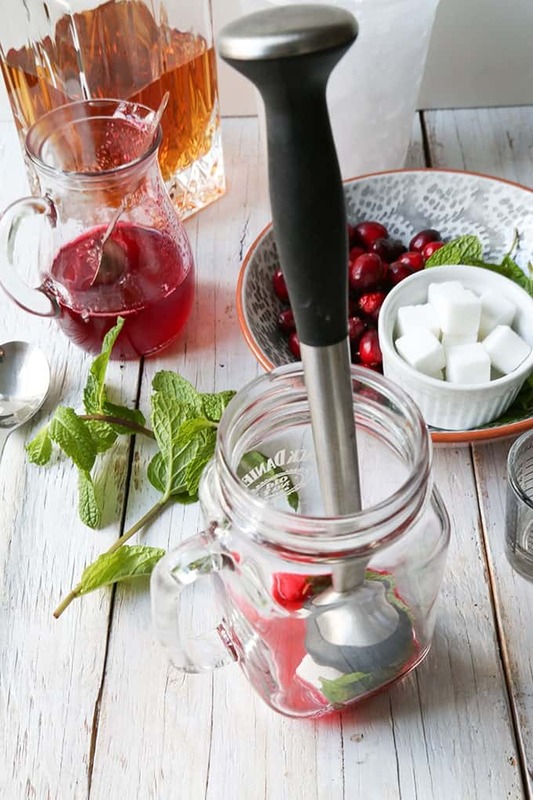 Add 1 Tbsp of cranberry syrup and muddle everything together until sugar cubes have dissolved. Fill glass with crushed ice. Add 2 1/2 oz of your favorite bourbon. (DO NOT use large ice cubes, you want CRUSHED ice. The drink is very strong and potent. It needs the crushed ice to dilute drink slightly.) Use a spoon to gently stir mixture together. Add additional crushed ice. Add another 1 Tbsp of cranberry syrup. 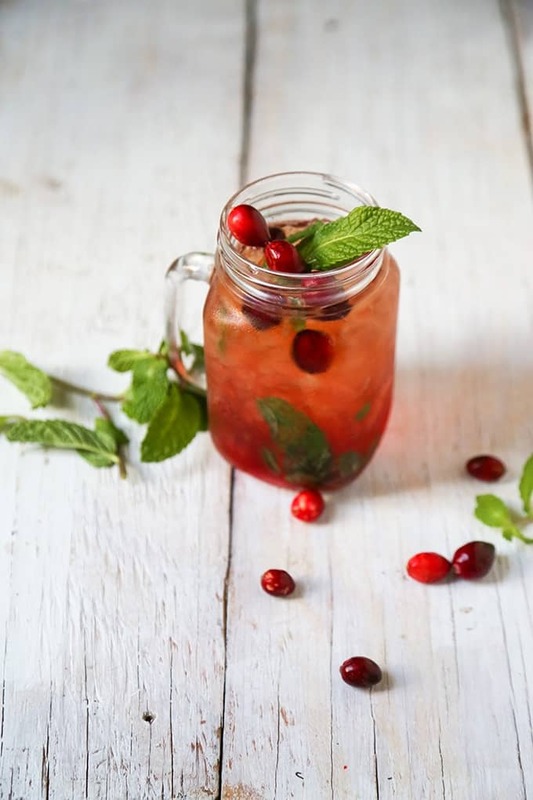 Garnish drink with mint leaves and fresh cranberries. Let mixture cool to room temperature. Transfer to a container with a lid, let chill in the fridge until mixture is cold. Remove mixture from fridge and strain. At this point the syrup should have thicken. Discard cranberries (or save to snack on!). Return cranberry syrup to fridge until ready to use. Thanks so much Jessiker! Cheers and Happy Thanksgiving! Better yet, you can use cocktail cranberries instead of the fresh berries. They can be muddled to add color and flavor. Check out Lounge Attire Cocktail Cranberries. Look at that color! This maybe my favorite lemonade ever. Definitely going to make it. But i’m afraid the color won’t be as beautiful as yours. Any good tips?